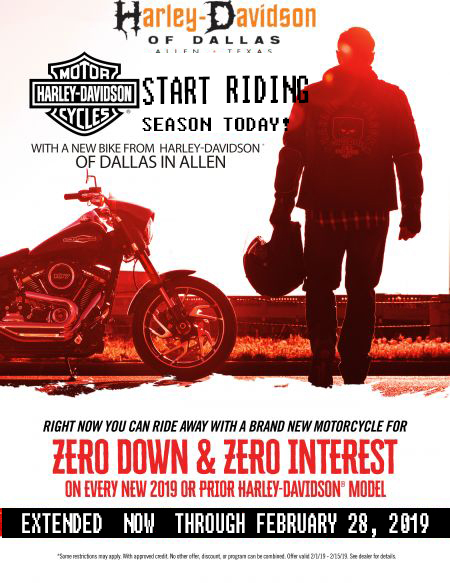 ZERO DOWN ZERO INTEREST EXTENDED UNTIL 2/28/2019 HARLEY-DAVIDSON® OF DALLAS IN ALLEN! Right now you can ride away with a brand new Motorcycle for Zero Down and Zero Interest on every new 2019 or prior Harley-Davidson® Model. *Offer valid now through February 28, 2019 ONLY. Some restrictions may apply. See dealer for details. With approved credit. Not to be combined with other offer or promotions.